This post and beam home's great room has a beautiful window wall accompanied by a stone fireplace with a wooden mantel. The lush mountain vistas and pleasant summer temperatures of the north Georgia mountains are quite a departure from the palm trees, sandy beaches and heat of south Florida. For Miami residents Dr. Jeffrey Murray, his wife, Beth, and their three dachshunds, this is the perfect dissimilarity for their second home. "With our primary home in Florida," says Jeffrey, "we wanted a tranquil and private getaway different from our busy lives in Miami." Through their research, the couple found the Georgian Highlands, a gated community only an hour away from the Atlanta airport. The Murrays were looking for a true refuge from the city — a convenient area rich with beautiful views. Their four acres in the foothills of the Appalachian Mountains gives them the privacy that they had desired. "It’s very natural with bears occasionally roaming through, with turkeys, deer and chipmunks," Jeffrey says. The Murrays chose builder Gary Harben to turn their vision into a custom vacation post and beam home. The couple had decided upon an Arts & Crafts-style facade adhering to the development’s architectural guidelines. The timber frame home’s inspiration comes from a Bob Timberlake house plan that Jeffrey discovered in a magazine. "I ordered the blueprints," Jeffrey says. "Then Beth and I wanted to take the design and put timber framing on the inside and keep the craftsman look on the outside." 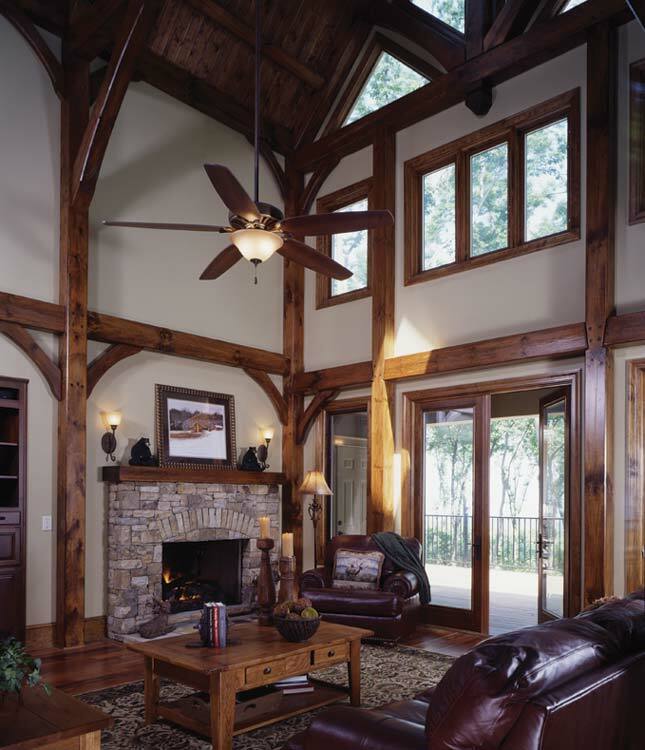 To incorporate the timber-frame portion of his idea, Jeffrey took his plans to Doug Tatham at Hearthstone Homes in Newport, Tennessee. The loft gives an up close view of the timber frame post and beam supreme craftsmanship evident in the rafters. Tatham and his design team worked with Jeffrey and the builder to finalize what timber frame trusses and other framing would be needed. Because the plan already had an open design, it was easy to fit the framing. "The timber frame is structural throughout the great room portion of the house," explains Tatham. "Then in the media room and master bedroom, it is decorative." The entire frame is built with kiln-dried eastern white pine, which creates a more stable frame before it is erected. Over the course of transferring the floor plan into the frame design, the Murrays expanded the original footprint to 3,938 square feet to include more bedrooms. Knowing that they would have a lot of family and friends visiting them, this additional room created an upper level that would comfortably sleep guests. In turn, the Murrays spend most of their time on the lower level to give everyone their own private area. The white pine posts and beams on the first level are stained to complement the exotic Tigerwood floors, which feature an orange color with dark veins giving it a tiger-like look. The framed foyer leads to the impressive great room with its soaring 27-foot ceilings. Two 4-foot skylights electronically open to vent the room with the help of a 52-inch ceiling fan. Triangular fixed glass windows combine with triple-pane casements in the feature wall. The stained trim of the windows matches the timber frame. "We wanted a warm and cozy wood feeling to pull the warmth in," Jeffrey says. The timbers in the other rooms on the main level are accents rather than structural. In the media room, the beams frame a custom media cabinet. Blackout shades within the windows lower to block light and create a true movie experience. 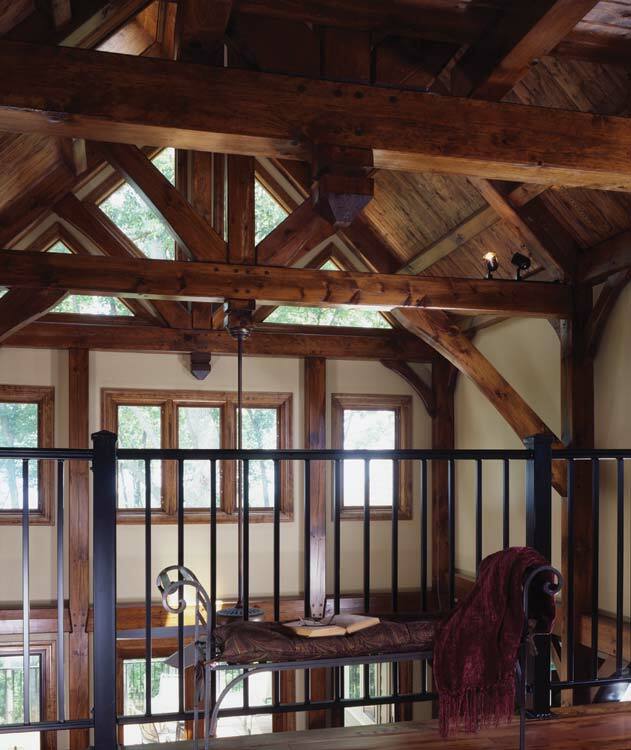 In the master bedroom, timber framing creates a bold pattern on the ceiling. In the master bathroom, radiant floor heating beneath the tiles warms the floor. Windows above the whirlpool tub offer impressive views of the mountains beyond. The gourmet kitchen has a wraparound counter island large enough for six and provide lots of space for meal preparation. 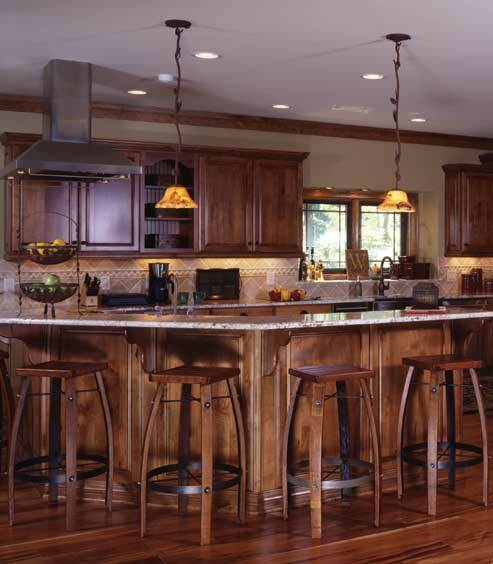 An L-shaped kitchen features a wraparound island with plenty of counter space to comfortably seat six. Two pendant fixtures and the many recessed light fixtures illuminate the area. The kitchen opens directly into the living space decorated with rich leather seating and Arts & Crafts-style tables and cabinetry. A custom-built cherry wood cabinet houses the television and creates ample media storage. Wide pine trim, also stained to match, ties the timber-framed room with the conventionally constructed sections. "The quality of the trim carpentry is outstanding," Tatham says. Because this is a second home built for relaxation, Jeffrey says, "I didn’t want anything that would be a lot of maintenance." Chosen for durability, fiber-cement siding and extra-strong shingles cover the exterior of the home. Adding to the sense of weight and durability, a half wall of stones anchors the post and beam home to its site. Shutters, trim and timber-frame accents in the gables are the only wood features on the exterior. Straightforward landscaping ties the yard to the surrounding forest. The cozy house in the mountains is tranquil and uncomplicated. These are traits that Jeffrey and Beth appreciate in their vacation home. "It’s a very simple house," Jeffrey says. "It’s pure timber framing, and we wanted to keep it that way."